Wilwood’s tandem chamber master cylinders are fully machined from a High-pressure die casting of a premium alloy, it incorporates slotted mounting flange to accommodate mount centers between 3.22” to 3.40” and also features side-hole mounts on 6.40” centers. Master cylinder is has full separation between the front and rear chambers . Dual outlets allow for right or left hand plumbing based on mount location. Offers a total piston stroke of 1.10” and a 2:1 volume ratio between the primary and secondary chambers. Available in 7/8”, 1” or 1-1/8” bore sizes. Available also in a media burnished version and a black E-coat finished units. Wilwood’s tandem chamber master cylinders for early Mustangs are fully machined from a High-pressure die casting of a premium alloy, it incorporates slotted mounting flange to accommodate the correct mount centers used in 60’s and 70’s Ford vehicles These master cylinders is has full separation between the front and rear chambers necessary for redundancy and safety. Dual outlets allow for right or left hand plumbing based on mount location and also offers a total piston stroke of 1.10”, with a 2:1 volume ratio between the primary and secondary chambers. Available in 7/8” bore and OE style adjustable pushrod that allows interface with manual pedal assemblies. Available also in a media burnished version and a black E-coat finished units. Wilwood’s Compact Combination Master Cylinders have been designed for limited space applications requiring the output capacity of a full size master cylinder. The ultra short 3.37”compact body provides 2.16” of additional clearance between the mounting flange and the fluid outlet. A full 1.12” of piston stroke meets or exceeds the stroke capacity of most full size cylinders. With 1/8” NPT fluid outlet port located at the top radius of the cylinder bore, reduces the chances for trapped air. The black E-Coated aluminum body resists corrosion and maintains a durable long lasting finish. Wilwood’s Compact Combination (Side Mount) Master Cylinders have been designed for limited space applications requiring the output capacity of a full size master cylinder. The ultra short 3.37”compact body provides 2.16” of additional clearance between the mounting boss and the fluid outlet. The new body design incorporates integral side mounting lugs with a 3.00” center to distance and no traditional mounting flange, which further enhances its ability to mount in tight spaces. A full 1.12” of piston stroke meets or exceeds the stroke capacity of most full size cylinders. With 1/8” NPT fluid outlet port located at the top radius of the cylinder bore, reduces the chances for trapped air. Enhanced fluid inlet port allows mounting of the standard reservoir included in kit and also contain 11/16-20 internal threads for custom reservoir arrangements. The black E-Coated aluminum body resists corrosion and maintains a durable long lasting finish. Wilwood High-Volume Aluminum Master feature high pressure die-cast bodies from high-grade aluminum. Wilwood. High-Volume Master Cylinders have the highest fluid capacity of any integral reservoir design. With a total capacity of 8.2 ounces, there is at least 26% more fluid volume than other brands. . With 1-7/16” of piston travel, it offers extra margin when used with large piston calipers. Heavy duty internal springs provide fast retraction. Formed steel lids with bellows type gaskets keep the fluid in and the moisture out. Wilwood master cylinders use common dimensions for flange or side mounting and a 1/8-27 NPT outlet port. This popular lightweight, compact design is used for clutch and small master cylinder requirements and is well known for its dependability. It incorporates an improved plastic screw-on filler cap which protects the fluid in the 1.4 ounce reservoir, and is available in all three bore sizes. Combination Remote Master Cylinders offer six different bore sizes and four different installation configurations that are available with this master cylinder kit. Precision machined from high strength aluminum, this kit includes both small and large size reservoirs which can be mounted directly on the master cylinder or remotely mounted for more convenient service access. Standard mounting bolt hole configurations provide easy applications for racing and off road vehicles, specialty cars, recreation and industrial vehicles. Made from durable lightweight aluminum with a large capacity plastic reservoir and dual outlet bores, this master cylinder utilizes standard O.E.M. internal components. Standard factory mounting bolt holes can be adapted to racing pedal assemblies with an optional mounting adapter bracket (including push rod and dust boot, see diagram below). This lightweight (2.5 pounds) reliable master cylinder is used for Drag Racing, Late Model Stock Cars, Street Rod and Off Road applications. Wilwood’s Remote Tandem master cylinders provide one of the safest ways to actuate four wheel or dual caliper axle brake systems. The cylinder features 50/50 output from a 1.00” bore with 1.10” stroke. This master cylinder can be bolted directly to Wilwood’s single mount pedals. The kit is shipped complete with the master cylinder, pre-installed 4 ounce reservoirs and 3.38” x 5/16-24 pushrod. This super lightweight (only .55 pounds) 1/2” bore aluminum master cylinder designed specifically for Kart and Jr. Dragster racing applications incorporates an adjustable lever ratio with a remote mount clear fluid reservoir for easy monitoring. The assembly comes ready to install and includes billet bracket, lockwired drilled hardware and fluid line fitting. The unit is best utilized in conjunction with Wilwood’s Kart / Jr. Dragster caliper. Wilwood’s 5/8” bore Right Hand Handlebar Master Cylinder is compact, lightweight and specifically designed for a variety of recreational, sport and outdoor equipment applications. Constructed of materials and finishes designed to resist corrosion, our master cylinder fits standard 7/8” diameter handlebars and is also available with matching L/H units. Impact resistant lever assembly comes with a three-position hydraulic parking brake lock. The housing is designed to accept a threaded brake light switch (1/4-32). The large capacity reservoir is translucent for easy fluid level viewing. The fluid inlet accepts an M10 × 1 thread, Banjo type fitting. Replacement cylinder assembly for Wilwood’s Kart master Cylinder. Easy bolt on replacement onto your existing bracket assembly. Wilwood’’s Right Hand Motorcycle Foot Pedal Master cylinder comes with show chrome finished body and lid. 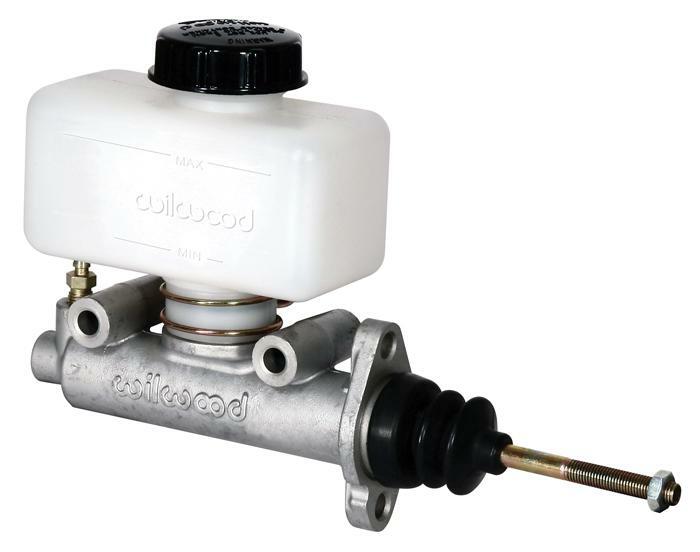 Constructed of billet aluminum, this forward control master cylinder comes with an industry standard 5/8” bore and 3/8-24 threaded outlet with relieved area for banjo fitting seal. Side mounting holes are 2.25” apart. The TM1 master cylinder is manufactured from lightweight aluminum with a 5/8” bore and dual 10mm x 1.00 outlets. Side mounting on 3.53” bolt spacing using 5/16” bolts, it’s compact design is perfect for applications where space is limited. Includes push rod, dust boot and a permanent mount .39” diameter clevis. An alternative 5/16-24” threaded pushrod is available under part # 230-7134. Remote reservoir kits are available under part # 260-11098. This “Pull Type” slave cylinder is made from billet aluminum for high strength and plated with a tough anti-corrosion finish. The stainless steel push rod has a longer stroke than most cylinders assuring a full release of the clutch. Ideal for Drag Racing, Late Model Stock, Pro Series and Off Road applications. Recommended master cylinder sizing is ¾”.